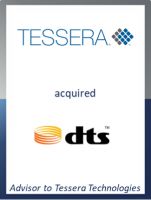 GCA Advises Tessera Technologies, Inc. on its Acquisition of DTS, Inc.
We are pleased to announce that our client, Tessera Technologies, Inc. (Nasdaq: TSRA or “Tessera”), has entered into a definitive agreement to acquire DTS, Inc. (Nasdaq: DTSI or “DTS”) for $42.50 per share, or approximately $850 million in equity value, in an all-cash transaction. This transaction marks a transformational step in the execution of Tessera’s strategic vision, with complementary technology portfolios that are ideally suited to deliver the next generation of audio and computer imaging solutions to mobile, consumer electronics, and automotive markets while expanding their ability to address new opportunities in IoT and AR/VR. The acquisition is expected to be immediately accretive to Tessera’s non-GAAP earnings per share. Tessera intends to fund the acquisition with a combination of available cash on hand and approximately $600 million of committed debt financing. Additionally, all of DTS's outstanding debt will be retired at the closing of the transaction. GCA acted as exclusive financial advisor to Tessera in connection with this transaction.